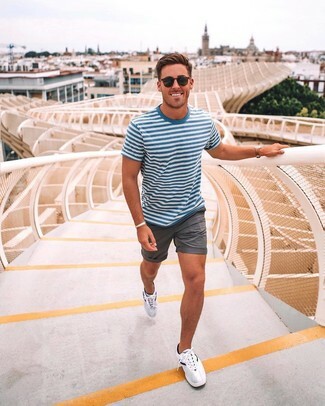 If you prefer functionality dressing when it comes to fashion, you'll love this simple pairing of a Levi's vintage clothing 1970s striped washed cotton jersey t shirt from MR PORTER and charcoal shorts. When it comes to footwear, this ensemble is complemented wonderfully with white low top sneakers. If you're looking for a casual yet stylish look, wear a Levi's vintage clothing 1970s striped washed cotton jersey t shirt and khaki chinos. Both garments are totally comfortable and will look great paired together. When it comes to footwear, this outfit is finished off nicely with white low top sneakers. 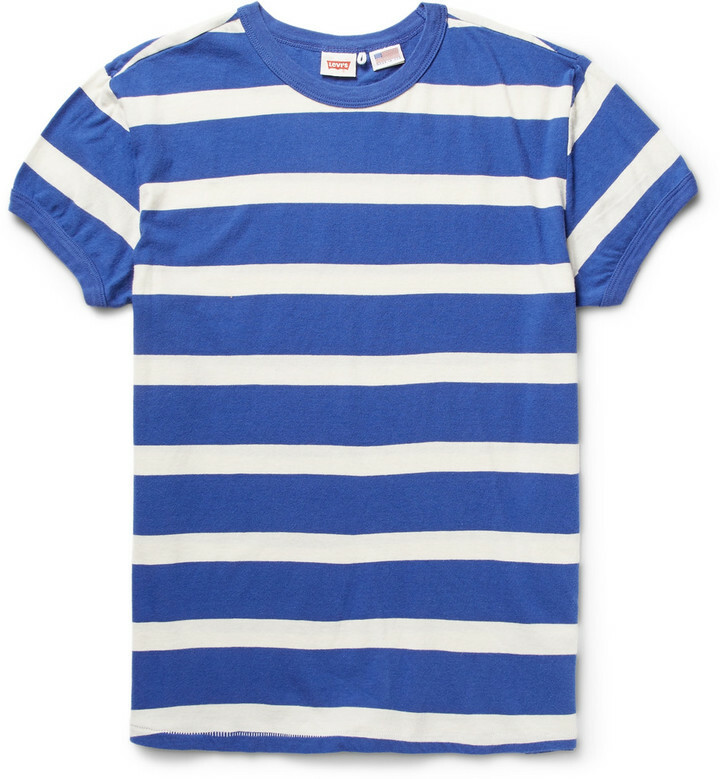 If you're a fan of practicality dressing when it comes to your personal style, you'll love this stylish combination of a Levi's vintage clothing 1970s striped washed cotton jersey t shirt from MR PORTER and navy jeans. 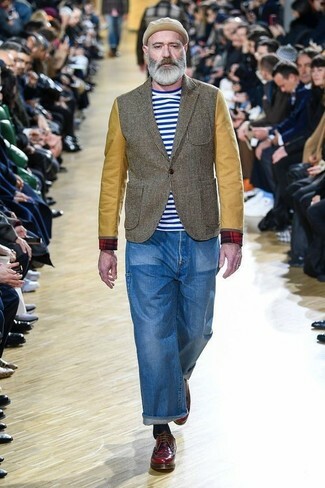 If you prefer relaxed dressing when it comes to fashion, you'll love this on-trend pairing of a Levi's vintage clothing 1970s striped washed cotton jersey t shirt and blue jeans. Got bored with this getup? Enter burgundy leather derby shoes to spice things up. If you're on the lookout for a casual yet stylish getup, marry a Levi's vintage clothing 1970s striped washed cotton jersey t shirt from MR PORTER with pink chinos. Both pieces are totally comfortable and will look great together. This ensemble is complemented perfectly with blue low top sneakers. 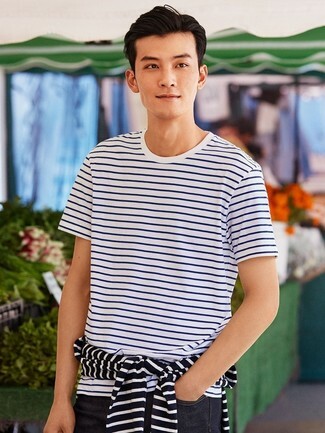 Go for a simple but casually stylish option marrying a white and blue horizontal striped crew-neck t-shirt and grey shorts. Take your outfit down a sportier path by wearing white athletic shoes. If you're on a mission for a casual yet dapper outfit, try pairing a white and blue horizontal striped crew-neck t-shirt with navy chinos. Both garments are totally comfortable and will look great paired together. 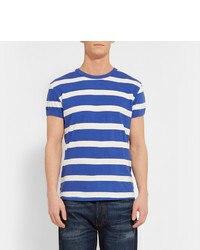 Marry a Levi's vintage clothing 1970s striped washed cotton jersey t shirt with blue jeans if you're looking for an outfit idea for when you want to look casually cool. Kick up the cool of your getup by completing it with charcoal plimsolls.